CD reviews: "Boogie for Hanuman" and "Wings and Shadows"
These reviews first appeared in the June 5, 1999 edition of the American Reporter. It's a small field of study, but fascinating: The community of musicians who try to bridge American jazz and the classical musics of India. Warren Senders has been right in the middle of those efforts. He lived in India for awhile, and studied the music  even fell in love with and married one of the musicians, guitarist Vijaya Sundaram. He and his wife formed a combo to explore common ground between jazz and Indian music, Antigravity. Their first album came out in '92, their second, "Boogie for Hanuman," early last year. Their first album has become an underground legend, one of those "must have" discs for the explorative of ear. It was an amazing recording, as seamless a blend of East and West as was ever laid down. Indian themes and instruments playing fully improvised solo passages a la Coltrane or Miles. "Boogie" has many of the same ambitions, and takes on the same challenges. The band is basically intact with a few changes. But Senders still composes and arranges the music, still provides the direction. As with the earlier outing, the results are often fascinating. The sound, to American ears, remains exotic and exciting: tabla drums underpinning the odd scales and chord played on sitar, bansuri and dilruba. And the improvisational passages remain intoxicating: Senders and Sundaram have surrounded themselves with gifted players. 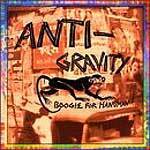 Ultimately, though, "Boogie for Hanuman" just isn't as interesting as the band's first recording. The energy level isn't as high, the creativity seems less vibrant. The band, frankly, not as inspired as on the first album  which was magic. Which hardly makes this album worth passing by  if it isn't quite as good as a classic, it's still more inventive, more interesting than most of what's being recorded these days. Besides, how many folks are even playing Indo-Jazz, anyway? Warren Senders is nothing if not eclectic. In addition to his jazz-Indian fusion, he's also recorded an album of Hindustani vocal music  and an album of ambient music with reed player Steve Gorn. 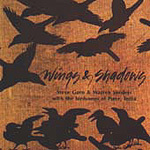 "Wings and Shadows" features Gorn playing flute and clarinet with Sanders on various hand percussion, all intermingled and mixed up with nature recordings of wild bird songs. The bird were captured on tape by Senders in '94 in Maharashtra, India, and he and Gorn then laid down their accompaniment to the flock in '96. It's not like most ambient recordings, though. This is more trance music than hypnotic background noise. Gorn and Senders don't simply play over top of the birds' singing; they play with it, in it, like two nets woven together. It's much more interesting than what the Nature Company sells.